Gray squirrels nest twice a year in the early spring and late summer. Their eyes open at four to six weeks of age. Most young come from the nest to explore their surroundings at approximately six weeks old under their mother's supervision. The mother will retrieve her young when fallen from the nest if not injured. If you are not sure the baby is orphaned, watch for a few minutes to see if the mother will come for it. Some signs of a baby being orphaned are being left on the ground more than an hour with no attention from the mother or left after dark. Flies, ants and other insects will be present. The baby will cry out for it's mother, looking under weight, or following someone around in the yard. Baby animals in need can be very trusting of humans. You can call a licensed wildlife rehabilitator for further information. Step 1: Keep warm. Place baby in a covered container (with air holes) with a soft cloth that will not snag and is free of any holes or strings on a heating pad set low or other source of heat. You can put dry rice in a sock and microwave for 30 seconds, and then place under bedding of baby. Step 2: Check for fly eggs. These may look like sawdust or clumps of white/yellow dirt. Remove these as quickly as possible. If they hatch they can cause further injury and possibly death. Step 3: Do not feed any milk or baby formula. Animals are lactose intolerant. There are special animal milk replacers used for their needs. After baby is warmed, you can offer diluted Pedialyte as a hydration fluid by a syringe or dropper. If possible, call a licensed wildlife rehabilitator to receive instructions before feeding. Step 4: Injuries, cat or dog attacks. Babies that have injuries or have been around cats or dogs will need antibiotics within the first eight hours to prevent infections from bacteria. Call a licensed wildlife rehabilitator as soon as possible. 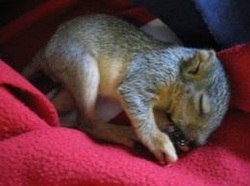 The baby's best chance of survival is to be taken to a wildlife rehabilitator as soon as possible.